Each business has its own unique challenges and thus needs it's own unique solutions. We believe in providing easy to use solutions with great UX and excellent support. Leading medical practice management system. 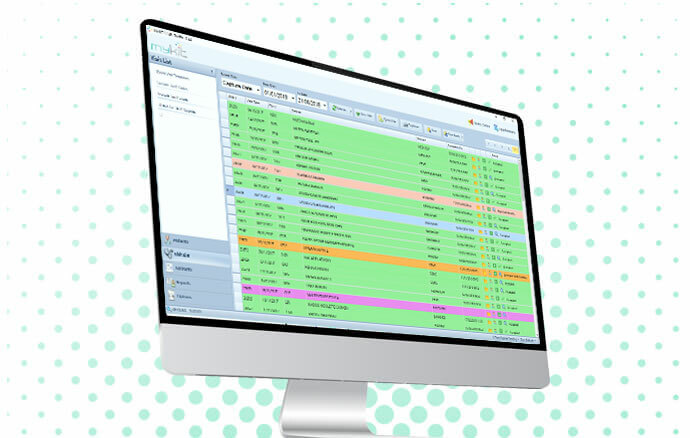 Designed for busy medical practices and bureaus, this desktop application provides unparalleled power and flexibility. Leading medical practice management system delivered to you in your PC and tablet. Best suited for individual practices and budding healthcare professionals. Best in class online point-of-care primary health centre management system. Customs clearence software integrated with SARS customs. When government introduced their e-health policy in 2012 we started to develop an EHR system for primary healthcare and hospitals that is interoperable. We are currently testing this system in a NHI pilot site in the NW Province. We have managed to create a system that combines all the priority areas when it comes to service delivery. Currently facilities are using three separate systems for reporting on different priority areas, one for TB, HIV/AIDS and one to report on the day-to-day operations of the facility. With the introduction of one patient record there is no need for three systems. Identify safety problems. Providers in some areas can use EHR systems to quickly find and notify patients who may be at risk for problems related to unsafe drugs or medical devices. Detect epidemics. The medical community can use EHRs to find unexpected increases in diseases within a community, enabling health officials to take action sooner to protect the public. Patterns of prescribing in pharmacy records could even help detect bioterrorism attacks on food systems or water supplies. Improve overall health care. With access to treatment and outcome data for thousands or millions of patients, researchers can improve care by exploring questions such as which treatments are most effective. Most researchers, public health departments, and others who might have access to health IT data for these purposes are bound by governmental law to maintain individual patient privacy, and in most cases, will not be accessing information that is identifiable. In the infant stages of Karabo IT we developed a customs clearing system (CusKIT) that is integrated with SARS (South African Revenue Service). We have managed to capture a significant portion of clearing agents servicing the Lesotho border posts in a very short period. Here we are enabling our clients to do their work in some of the most difficult terrains South Africa has to offer. We have enabled our clients to grow their business without creating a huge burden of cost that is associated with this type of industry software. On this system we work in close cooperation with SARS, as it is an ever-changing industry. CusKIT is always inline with all legislative and SARS system requirements. The challenge when it comes to managing any service industry comes with having a proper management system in place. In the healthcare industry it is very difficult using systems like these as the people providing the services, (Health care professionals like doctors and nurses) is not particular keen on using technology, as they feel that takes away valuable time from them that could have been used to service patients. So the challenge here was to develop a system (MedKIT) that can add value to their environment. On the decision of the UI we had to look at other industries were systems have made a huge impact, and are in an advanced stage when it comes to technology. We managed to bring together the right mixes of technology from different industries, and can confidently say that people using our management systems are truly empowered to get the best out of their investment. Our systems allows our client to make better clinical decisions based on past visit history but also ensure that clients get reimbursed for services delivered. This system is mostly used in private industry healthcare professionals and hospitals, and is focused on billing and managing the billing process. Looking for an online practice management system? MyKIT online is the perfect management solution for your growing medical practice. Try MyKIT online now. Your first month is on us! Call or email us for an appointment to discuss your software requirements.